When Tammy Koch’s grandfather was diagnosed with lung cancer, she saw first-hand how having a strong support system could help a cancer patient. Her grandfather moved from Holden, Alta., to Spruce Grove to live with Koch and her family, a move that helped to lessen his financial and social stresses and gave him much needed companionship during his cancer journey. Years later, when the opportunity to work in cancer care presented itself to Koch, she took it, knowing she could make others’ cancer experiences as positive as the one her grandfather had. Similarly, when several members of Carolyn Murphy’s family were touched by the disease, Murphy witnessed them struggle to understand the medical jargon, and saw how they often felt confused and lost throughout their illness. A career helping cancer patients was a logical choice — Murphy wanted to assist them by eliminating that confusion and making them feel at ease. Today, both Koch and Murphy help to make rural Alberta cancer patients’ experiences a little less overwhelming. They are the only two nurses working at the Hinton Community Cancer Centre, located in the Hinton Healthcare Centre. According to Koch, as rural nurses they “wear a lot of hats.” Indeed, their roles and responsibilities shift quite a bit throughout a typical work week. Tuesdays through Thursdays, Koch and Murphy serve as oncology nurses in the Hinton Community Cancer Centre, doing patient assessments and administering chemotherapy. But on Mondays and Fridays, both nurses take on a different role in that same centre — that of cancer patient navigator. Essential for overall patient well-being, Alberta Cancer Foundation Patient Navigators provide support and assistance to patients in any way they’re struggling, whether those struggles are physical, spiritual, psychological or practical. “If there is anything that is causing patients stress when they’re going through their cancer journey, we want to be able to have some dedicated time to help them through it,” says Murphy, who was initially hired in October 2016 to cover a maternity leave and is now a casual clinic nurse and cancer patient navigator. For Murphy and Koch, addressing a patient’s stress can mean anything from letting them know what side effects they can expect during treatment (and how to ease those symptoms), to referring them to a mental health expert, to letting them know where they can get financial help or other resources they may need. And sometimes, it just means being there to chat when patients have no one else. 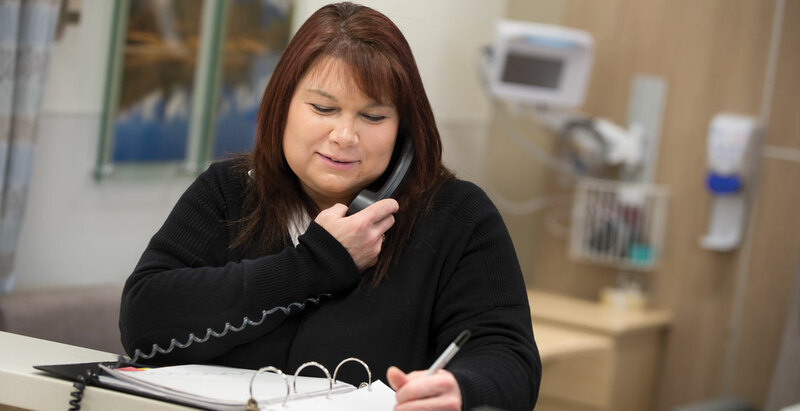 In addition to providing navigation services to patients who visit the Hinton Community Cancer Centre, both nurses also assist patients in Hinton’s catchment area — which includes the towns of Jasper, Edson and Grande Cache — over the phone. As navigators, their commitment to each patient is extensive: it begins at diagnosis and continues right to survivorship or palliative care. Koch and Murphy keep in touch with patients throughout the course of their illness, so patients feel comfortable opening up to them. And the nurses both express how grateful they feel that patients are willing to let them into their lives. Koch has many stories of patients who have expressed how much easier navigation has made their cancer experience, but one story in particular sticks with her. Dorothea Presakarchuk is another Hinton resident who has been positively affected by the nurses’ cancer patient navigation services. Diagnosed with breast cancer in January 2017, Presakarchuk has been seeing Koch and Murphy since April. Changes to funding at the clinic have helped Koch and Murphy provide their patients with a better level of care than ever before. 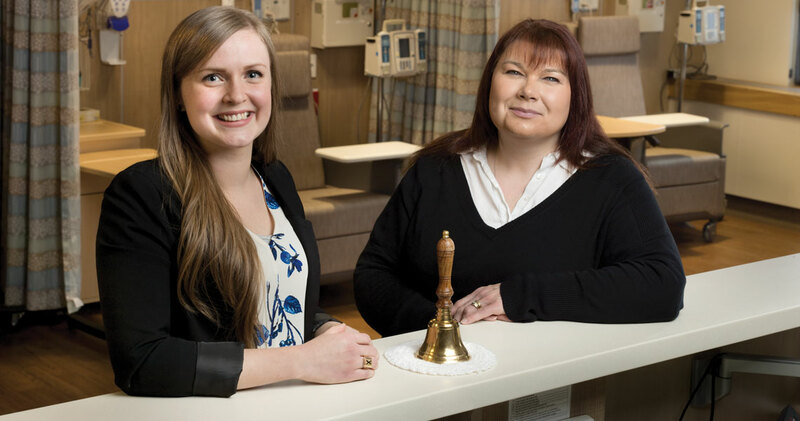 While patient navigation isn’t a new concept, Hinton Healthcare Centre site manager Fiona Murray-Galbraith explains that the cancer centre began to receive funding from the Alberta Cancer Foundation in 2013. This funding allowed the centre to extend its hours and open five days a week, as opposed to just three. It also allowed the nurses designated time to spend with their patients. “We now have time to actually sit down with patients, see if they have any questions, see how they’re feeling and explore any other concerns,” says Murphy. Recent renovations have also helped. Thanks to a $1.2-million provincial grant, the Hinton Community Cancer Centre has been able to modernize and double its size. Construction began in September 2015 and finished less than one year later, in June 2016. “Before the renovations, we had a very small space which we identified as having some patient comfort issues, patient confidentiality issues and also patient safety issues,” says Murray-Galbraith. Koch says the new space allows her and Murphy to care for their patients to the best of their abilities. Not only are patients given more privacy, but, thanks to Alberta Cancer Foundation donor support, they are now made much more comfortable due to new clinic additions that include Cadillac chairs with heat and massage for those receiving chemotherapy, a TV and sound system, and a small kitchen. But Murray-Galbraith believes the new space is a bonus and that it’s the nurses, the physicians and all the staff who are the heart of the Hinton Community Cancer Centre. Tammy Koch. Photograph by Bluefish Studios. Carolyn Murphy. Photograph by Bluefish Studios. Completed a Bachelor of Science in Nursing from St. Francis Xavier University in Antigonish, N.S. To make a difference in the lives of Albertans facing cancer, click here.